‘She made a mean beef stroganoff’ – not what you would expect to be the first line in a famed rocket scientist’s New York Times obituary, yet this was how Yvonne Brill’s originally started. The fact that ‘she was a brilliant rocket scientist’ seemingly faded into shadow. 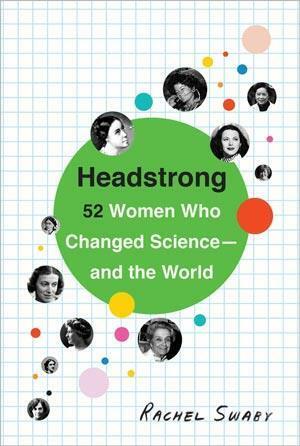 This is the fuel for Headstrong, a book focusing on 52 scientists – all of whom are women – from household names to those who received no recognition for their work, but all of whom led fascinating lives. Despite it sometimes being necessary to know someone’s gender, Rachel Swaby justly points out women are often labelled as being ‘female scientists’, yet men are simply ‘scientists’. The material in Headstrong is separated into seven chapters of which none are ‘chemistry’. At first I found this interesting as ‘physics’ and ‘biology’ had dedicated chapters. I quickly discovered, however, that any ‘chemistry’ entries were nestled within the application to which the science was focused. For example, Dorothy Hodgkins, well known for her work in protein crystallography for which she was awarded the 1964 Nobel prize in chemistry, or, disparagingly, the ‘Nobel prize for British wife’ according to one newspaper, is found within the ‘medicine’ chapter. Yet I cannot fail to notice that on the inside front cover diagram she is labelled as a chemist and chemist is, in fact, the most popular discipline found on the image. Reading about Stephanie Kwolek, Nylon and the ‘rope trick’ took me back to high school chemistry, where we once spent a lesson trying to make the longest ‘net’ or ‘string’ of nylon from a beaker. Kwolek was fascinated with fabrics and sewing, believing she would go into the fashion industry, which to some extent came true. After publishing her paper on Nylon, she went on to design Kevlar, a fabric that could ‘stop a speeding bullet’. Between Nylon and Kevlar, Kwolek ‘challenge[d] the concept of what a material is capable of’. The detail given in each profile, and the style in which they are written, enables the reader to learn about the scientist’s discoveries as well as their life in general, making it an easy read. In a recent interview, Swaby shared that even though her dream readers are ‘young women thinking about going into STEM fields, [actually] … we could all stand to learn more about these amazing women’.